The win could reverberate beyond Alberta, setting the party on a collision course with PM Justin Trudeau&apos;s Liberals over climate change. Mr Kenney has vowed to do away with a provincial carbon levy and to join four other provinces - including Ontario, Canada&apos;s most populous province - in fighting the federal government in court over its carbon tax. The government recently imposed carbon taxes on four of Canada&apos;s 10 provinces - Ontario, Saskatchewan, Manitoba and New Brunswick - for failing to introduce their own plans for tackling climate change. The UCP&apos;s victory ends four years in power for the NDP, whose 2015 victory rocked one of Canada&apos;s most conservative provinces. The 28-day election campaign in Canada&apos;s fourth most populous province centred around its uneasy economic future and its beleaguered energy sector. In his victory speech, the premier-elect promised quick relief for Albertans. Voters in the country&apos;s oil heartland are worried about the state of the economy amid slumping commodity prices. "For Alberta voters, the election was driven almost entirely by economic concerns; specifically, the province&apos;s deep-seated anxiety about its oil and gas industry and the inability to increase the amount of oil it can get to market," said national non-profit pollster Angus Reid. 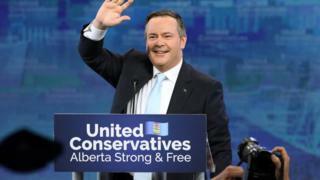 Mr Kenney campaigned as a champion of the oil sector, promising to fund a "war room" to defend Canada&apos;s energy resources at home and abroad. Published on Wed, 17 Apr 2019 04:52:11 GMT, © All rights reserved by the publisher.